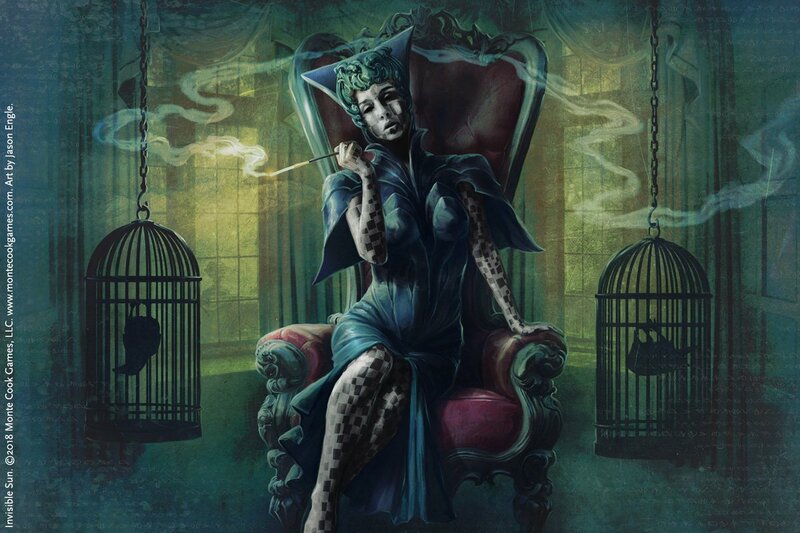 The Raven Wants What You Have is an Invisible Sun actual play created by Monte Cook Games and streamed via their Twitch channel. The primary cast is Monte Cook (Game Master), Bruce Cordell (as Savion), Shanna Germain (as In’Kalia Sengali), Sean Reynolds (as Seru), and Darcy Ross (as The Cicatrix). Season 1 is still in progress, with 9 episodes so far, plus an assortment of supporting content, including Development Mode side scenes and “Live from the Actuality” discussions among the players. The Cicatrix – An Apostate who has died & returned to life, she seeks to restore the Order of the Honed Thought. Savion Clay – A Goetic with a penchant for caging his enemies, Savion aims to do the same to his wicked father. In’kalia Sengali – a talented Maker who enjoys eating knowledge and rearranging the “brain furniture” of her foes. Seru – a glass-crafting Weaver who aims to assemble a glass sword that can channel magic from each of the suns. Kenden – a professional thief who has numbers in their eyes and can create duplicates of themselves. Omarius – Snail Guardian of The Ever-dying goddess, possesses a bejewelled shell which reflects spells. Lar – Librarian of Menters, eats a lot on the job. Thae Nitaris – Jack of all studies. Raven on one shoulder, dove on other. Ouriester – Ghost Girlfriend of The Cicatrix & Ex of In’kalia. Bode – fight co-ordinator at Cadavers. In the first Action Mode session of The Raven Wants What You Have, the characters each receive a mysterious package containing three gifts, starting them on a journey of surreal twists and turns. Beings: The Cicatrix, Seru, etc. Items: The Smouldering Violin, etc.